Newly-released pictures show Kim Jong Un visiting children at a hospital and orphanage in the North Korean capital. 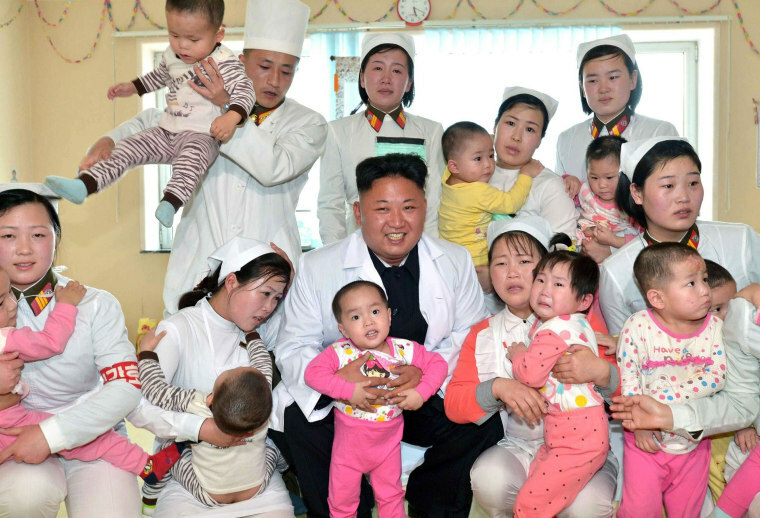 The images show Kim and his wife Ri Sol Ju being greeted by youngsters at the Taesongsan General Hospital in Pyongyang. The photos were released just days after Kim's government apologized to families bereaved when an apartment building collapsed in the city. The acknowledgement of that disaster was a rare admission of fallibility from the reclusive state. When he entered the sickrooms for the children of the orphanage, they rushed to his arms, each asking "How are you Marshal?" and "Let me come to your arms." He held the children in his arms and was very pleased that they all looked well, healthy and plump.When he kindly asked them how old they were, if they had good meals and what they were playing, they lively answered that they saw him on TV.They sang the song "We are the happiest in the world" full of vigor and said "Thank You, Father Marshal".His eyes shone with tears when he lulled them clinging to his sleeves, reluctant to part with him.